Story Time with Sophie, Deirdre, Maria and the children from “Little Stars” Navan Rd. Dublin 7. This is the story of how two young adults with a physical and intellectual disability undertook a new valued role in their local crèche. 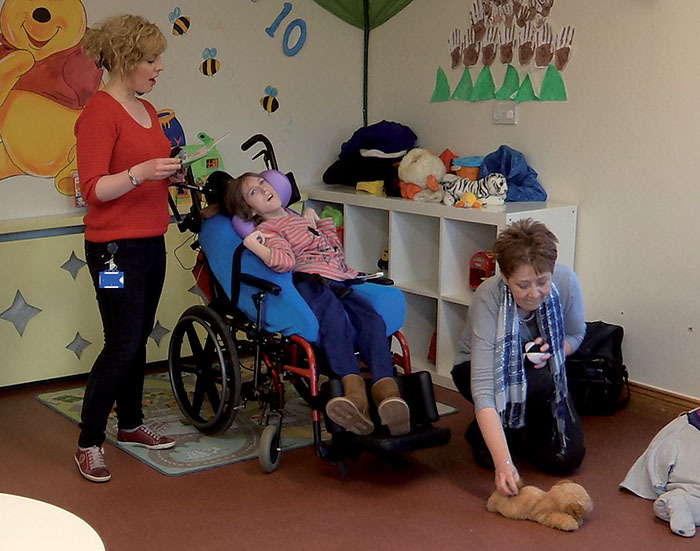 It involves Jackie and Sophie, the innovative staff from Siamsa, the use of appropriate Assistive Technology, hard work and a warm welcome from Sandra and the children of Little Stars, on the Navan Rd. 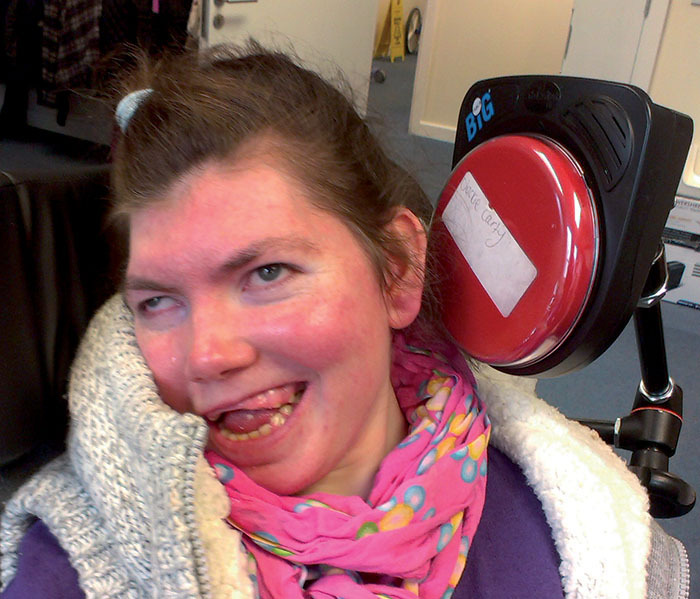 Following on from an information sharing session at the Emersion Conference held in Killarney in the Summer 2013 staff from Siamsa were inspired when they heard about a girl with a profound disability who went to a crèche and helped tell the children stories…. As it happens there is a crèche across the road from St. Vincent’s centre “Little Stars”, and the staff in Siamsa felt that it may offer some of the young adults an opportunity to get involved in their community. When approached the staff in Little Stars were very welcoming and delighted with the offer of help with story time each Monday morning. Back in Siamsa a discussion took place about who would enjoy working with children, be interested in helping out with story time and have the skills to use the assistive technology (BIGmack) that would make it possible. Jackie and the staff got together and picked their first story. The children who would be listening to the story were aged 3 and 4 years. It was important that Jackie would have a key part to play in the story telling and of course that the children would enjoy the story. It was agreed that the first story would be the popular “The Very Hungry Caterpillar”. In this story a very important line “but I’m still hungry” is repeated throughout the story, this line was recorded onto Jackie’s BIGmack. The plan was that the staff would tell their part of the story and at the appropriate time Jackie with a prompt would move her head to press her BIGmack thus delivering the important line “but I’m still hungry”. It was crucial that this worked well for the children as well as Jackie so props were made to enhance the telling of the story. Jackie and the staff practised using her BIGmack and the props to get the story just right. So in October 2013 Jackie and staff started going to the crèche for story time. Jackie delivered her story line moving her head to the side to activate the recording on the BIGmack and it was a great success. From the very first day all the children were really friendly and receptive. After a while Sophie showed an interest in being involved in story time too, so now they take it in turn every Monday morning. Sophie uses her head to activate a pillow switch which is attached to the BIGmack. When the pillow switch is pressed it activates the BIGmack, AS Sophie finds the pillow switch easier to activate. It was decided to do a different story every second week ensuring that the story contains a key recurring phrase that is recorded onto the BIGmack. There is a lot of work every week with deciding on the story, recording it on the BIGmack, making props and practising to get it just right. Jackie and Sophie are getting great enjoyment from story time in Little Stars, the preparation, meeting the children, going for coffee and chat with staff afterwards and of course being involved in their community. Sandra, the manager said that this is a great opportunity for the children to interact in such a fun activity with people who have a disability. This Christmas one of the children asked Santa for a wheelchair like Jackie’s and Sophie’s – she wanted it for her teddy, and it arrived! Every Monday they ask who is coming today as they come down the stairs they can be heard asking “is it Jackie or Sophie?” when they see who it is they have a big “Hi” the staff don’t get a look in! BIGmack* – Record any single message for up to two minutes directly into the BIGmack then press its large activation surface for playback. 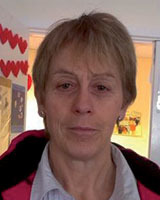 Joan Nolan, CNM 2, Siamsa, Adult Day Services, Daughters of Charity, St. Vincent’s Centre, Navan Road, Dublin 7. 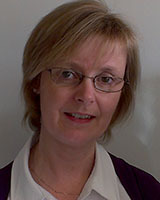 Stephanie Lynch, Clinical Nurse Specialist, Assistive Technology, Daughters of Charity, St. Vincent’s Centre, Navan Road, Dublin 7.